They say three’s a crowd, but when Boyd moves back in to the family home with his now-amicably estranged wife Vita, accompanied by his impossibly beautiful twenty-seven-year-old girlfriend Honey, it seems the perfect solution: Boyd can get his finances back on track while he deals with his difficult, ailing mother; Honey can keep herself safe from her secret, troubled past; and Vita can carry on painting portraits of the pets she dislikes and telling herself she no longer minds her marriage is over. For Vita, Boyd and Honey, love proves to be a surprising, dangerous thing and one year on, their lives are changed forever. 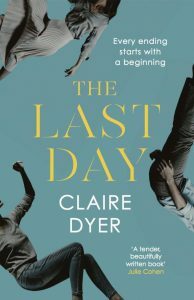 The Dome Press, the new publishing imprint of D H H Literary Agency, has signed Claire Dyer’s new novel, The Last Day. The publisher acquired world English rights from Broo Doherty at its own D H H Literary Agency. The blurb for The Last Day reads: “Since the end of her marriage, Vita has regained her happiness and remained civilised friends with her husband, Boyd. So much so that it seems natural – almost – for him to move back into their marital home as he goes through financial difficulties, even though he brings with him Honey, his beautiful and much younger new love. Vita is fine about it, she really is. But Honey isn’t just blonde hair and long, graceful limbs – she loves Boyd with a passion and is hiding secrets of her own. Dyer’s previous novels, The Moment and The Perfect Affair and her short story, “Falling for Gatsby” were published by Quercus. Her poetry collections, Interference Effects and Eleven Rooms, are published by Two Rivers Press. Dyer added that she was “thrilled” by the deal. “My thanks must go to Broo Doherty and the team at the DHH Literary Agency for making it possible,” she said.